Real4K™ Optical Adapters are simple “plus and play” dongles that convert electrical HDMI signals to optical signals and back again allowing for a full 18 Gbps HDMI over distances as long as 1000 meters (typical). Optical cabling provides the extra bandwidth to enable video content that isn’t compressed or color reduced in order to get the signal from the source to the display. In addition, Real4K™ adapters can be upgraded in the field to Real8K™ optical adapters when available. 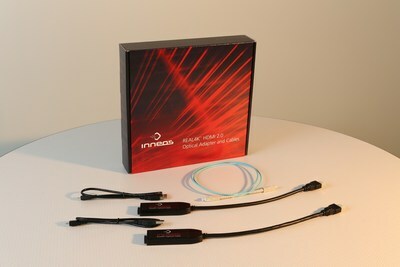 PLEASANTON, Calif., July 6, 2017 /PRNewswire/ -- Inneos' Real4K™ 18 Gbps Optical Adapter, was selected by NewBay Media's AV Technology brand for Best of Show at InfoComm 2017. The Best of Show winners represent outstanding achievements in product development and were selected from thousands of solutions showcased by more than 950 manufacturers. "We are extremely honored to be selected as a winner of this award," said Brian Peters, Inneos CEO. "This validates the need for a simple 18 Gbps HDMI interconnect that enables 4K the way it was meant to be seen," Peters continued. "This year we have had an overwhelming response to our AV Technology Best of Show Awards with more single entries than any other year on record," said Margot Douaihy, editorial director of AV Technology. "We try to honor the perspective of tech managers who are tasked with finding the right products for their capital expense requests or lifecycle plans—solutions they can trust and stand behind." Real4K™ Optical Adapters are simple "plug and play" dongles that convert electrical HDMI signals to optical signals and back again allowing for a full 18 Gbps HDMI over distances up to 1000 meters (typical). Optical cabling provides the extra bandwidth to enable video content that isn't compressed or color reduced in order to get the signal from the source to the display. In addition, Real4K™ adapters can be upgraded in the field to Real8K™ optical adapters when available. NewBay provides multichannel marketing solutions and information to communities encompassing over 5 million professionals and nearly 8 million enthusiasts centered around three large technology driven interrelated markets: Television & Video, Entertainment & Educational Technology, and Music. NewBay's platform provides its communities with award-winning content, trusted brands and high- profile network-building, informative events. Over 4,000 clients hire NewBay to connect them to its audience of key decision makers and influencers.